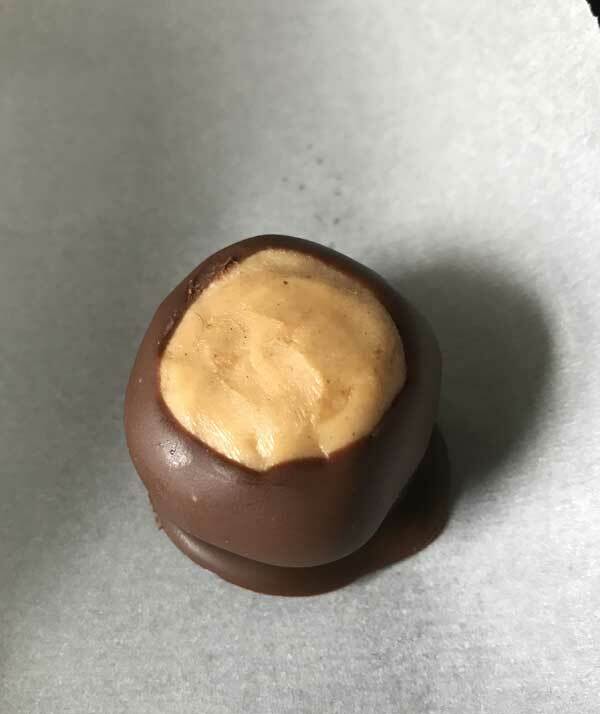 I may not be from Ohio, but Peanut Butter Buckeyes are probably my favorite homemade candy and I have lots of different recipes. This one’s my favorite. It has plenty of peanut butter flavor, is not too sweet, and the candy still holds its shape when formed. The trick is adding melted white chips (peanut butter chips work too) which firm up as the peanut butter balls are chilled and give the candies structure without making them overly sweet. I learned the trick from Cook’s Country, but I felt like their recipe still needed more peanut butter, so my ratio is a little bit higher. The peanut butter mixture is slightly softer and the balls need to be frozen before dipping, but once the candies are dipped and the chocolate sets, everything holds together nicely. I rarely make the full recipe at a time. Usually I’ll make a half batch, freeze the peanut butter balls, then take out a couple and dip them in whatever chocolate I have around at the time. This is my favorite version of Buckeyes. The white chips add sweetness and firmness without making the peanut butter portion overly sweet. Melt the white chips and 1 tablespoon of the butter in the microwave using 50% power and stirring every 30 seconds. Set aside. Beat the remaining tablespoon of softened butter, the peanut butter and vanilla until well mixed, then add the melted chip mixture and 1/2 cup of the powdered sugar. Continue adding powdered sugar until you've used the full 1 1/2 cups. The dough should be thick enough to shape, but if it's not you can throw it in the refrigerator for a few minutes. Shape into about 32 balls (see note). Put the balls on a parchment or wax paper lined tray or a couple of plates -- something you can fit in the freezer. Freeze the balls for about 30 minutes before dipping. Melt chocolate chips and shortening (if using) in a microwave-safe bowl at 50% power, stirring every 30 to 60 seconds (60 is usually fine). Using a toothpick, dip peanut butter balls partially into chocolate, keeping the top uncovered. Chill until chocolate has hardened. The peanut butter mixture starts out soft, so you'll end up having to chill it. I like to scoop out the 32 (or so) portions, chill, then shape the already chilled portions. If you can't work with the filling or find it's too soft and don't want to deal with chilling/freezing shenanigans, make these as peanut butter cups instead. Spoon melted chocolate into bottom of a mini or regular size muffin tins lined with cupcake papers. Flatten a portion of peanut butter filling and stick it in the middle, then cover with more melted chocolate. Freeze or chill until set. When cold, peel off the paper. My niece just made some of these and they made me think of you so I had to look at one of your recipes.